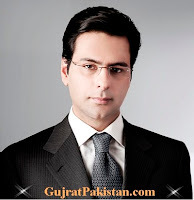 Chaudhry Moonis Elahi is the Political Successor of Chaudhry Brothers of Gujrat. He is the elder son of Chaudhry Pervez Elahi, former Chief Minister of Punjab. Moonis Elahi is inspired from Quaid e Azam Muhammad Ali Jinnah, Mahathir Mohammad and Russian Prime Minister Vladimir Putin and impressed with the enthusiasm and dedication of Abdul Sattar Edhi. Moonis Elahi got married in 2005 and he has a daughter. Nusrat Fateh Ali Khan is favorite singer of Moonis Elahi. He is also a sportsman and like swimming. His hobby is reading books about history and politics. Name of Moonis Elahi is also being associated with NICL Scandal. Why son of every politician is a politician ? Is it Kingdom in Pakistan or Democracy. Punjab was gifted by Allah with a leadership which really cared for the poor in the form of Moonis Elahi PMLQ. We did not deserve them and that's why we didn't vote for them in the next elections. Now we are all doomed at the hands of Showbaz Sharif whose face is plastered on every poster of tall claims and nothing for our prosperity.